This past weekend we had lots of family here visiting, including my adorable baby niece, Grace Anne! It's such a treat when they'll come to visit, we all miss having a baby around so much, and she is just the sweetest, most smiley-est baby! Early Sunday afternoon while we were playing Haila asked if she could make a new quilted pillow, this time just for Grace, so we dove right in! We picked out a few fat quarters from my stash of Lotta Jansdotter fabrics, specifically in prints to match up with the Glimma Quilt I gave to Grace at Christmas time. We spray basted the fabric to a 15" square piece of batting, Haila chose a matching yellow Aurifil, and handled the quilting like a pro! I love the wonky-ness of her stitches so much! Part of me hopes that doesn't change as she gets more and more comfortable, but I know it's bound to. This time I hovered a little less compared to our last pillow making session, and by her last few stitches I had moved the speed up almost all the way! I helped out with the trimming, backing, and finishing, and then she tied it up with a little twine bow before handing it over to Grace! Another sewing finish for my girl and Yes, we think Grace loves it!! She's mentioned wanting a blog of her own, so we'll see... :) For now I'm more than happy to share! Haila, it's perfect and I know Grace loves it! Way to go! Thanks Sarah! I'm so proud, of both her sewing and her generosity! cute! what quilt is she laying on? the whole color combo of this all is beautiful. Haila, what a nice thing to do for your cousin and you did such a great job! Love the fact that she wanted to make a gift for Grace. She getting pretty good on that real sewing machine. The pillow is wonderful. Such sweet photos. Hope Grace enjoys here pillow. You've done a wonderful job Haila...you'll definitely give us a run for our money when your older. Congrats to Haila on another great project!! Love the Lotta J fabrics. And baby Grace is just TOO cute!!!! So sweet. Tell Haila she did a great job. Haila did great! I love seeing her bright smile with her finished pillow. How sweet that she wanted to make something for Baby Grace. Oh man! The 'wonkiness' is so perfect for this print! Beautiful job Haila! 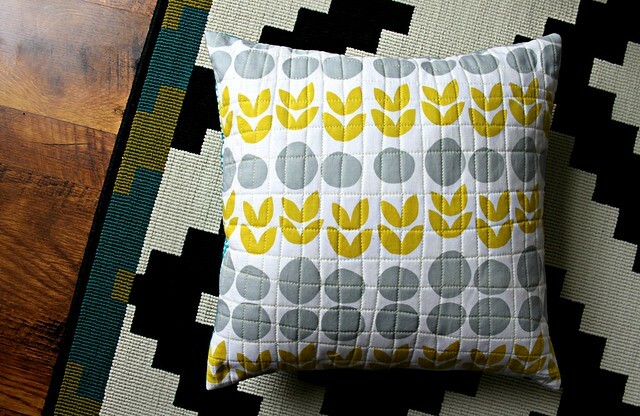 I just bought some AMH linen and velveteen to make pillows like this for our lounge room. Been thinking of patchwork designs for ages and then it suddenly occurred to me that I don't have enough time, and if I make one like this, Tully can help me. I love when inspiration like that hits! Two gorgeous girls + a beautiful pillow = a wonderful post. Haila, you are so talented! I am sure that Grace loves your pillow, and as she gets older she will treasure it even more because her cousin made it for her. Very sweet. Your daughter looks so proud of her finish. Thank you, you're sweet! 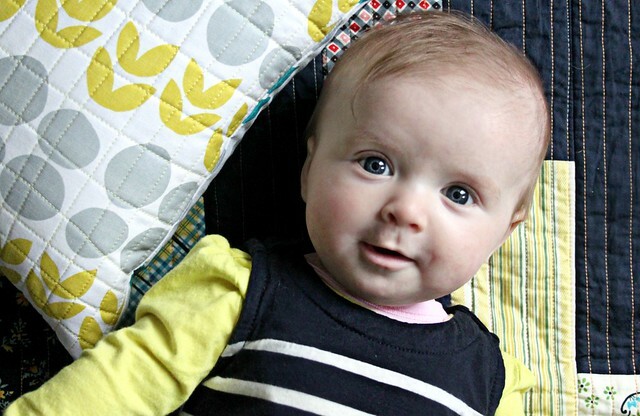 I love the simplicity of these pillow projects for sewing with her right now. She's learning so much already and I'm all about taking this slow so she doesn't get ahead of herself and feel discouraged. Next we plan to make simple doll quilts for her American Girl dolls and I can't wait!! It is really fantastic that you are giving Haila the room to experience sewing/quilting/making on her own. Grace is a cutey-pie. Happy Friday! Both of these children are so adorable! I miss having little ones! That's the sweetest post! My oldest girl is 8 and she got a sewing machine for Christmas two years ago. I am so amazed at her creations and my husband often says "some day the student will become the master." That's not too far off. She can visualize measurements (making clothes for her horses and dolls) like nobody's business. Now that she can read well I'm sure she'll be following patterns in no time. It's just the rotary cutter that scares me. I've let her use it before but I prefer to cut for her or let her trace the ruler and then cut with scissors. Very nice work, Haila! What a great way to pass on the love!